Though iPhone is known to be the safest yet fastest mobile devices around, it can still a series of problems. Many readers have asked for a permanent solution to the “iPhone stopped working” that led us to write this detailed guide. Remember, if your iPhone only hangs for a few moments, it is still necessary to look for a solution as possible. You don’t want a stuck iPhone while texting, calling, or using the iPhone, right? Following are some reliable solutions to fix iPhone stopped working issues. Press the hold down the Home button and Sleep/Wake button simultaneously. 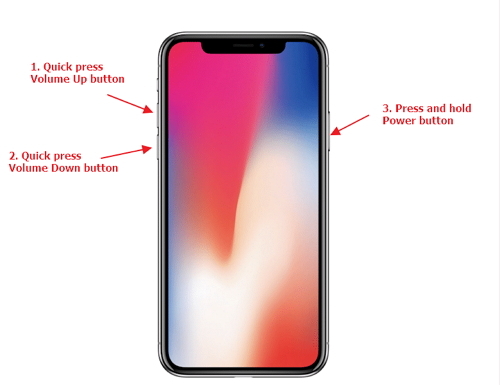 Keep holding both buttons until the Apple logo shows up. If the force restart method doesn’t work and your iPhone still stops working at moments. Following are some advanced solutions to iPhone stopped working issue. The best yet simplest way to fix the iPhone stopped working issue is by using a third-party iPhone fix software. There are several programs or software available on the internet providing a vast range of features to fix iPhone issues. iMyFone D-Back is an all-in-one solution to your iPhone problems. Whether you have lost valuable data without having a backup, app icons are disappeared, or iPhone has stopped working, it has got you covered. If you are concerned about the procedure to fix your iPhone, worry no more because iMyFone D-Back comes with an easy installation and user-friendly interface – specifically made for non-tech people. 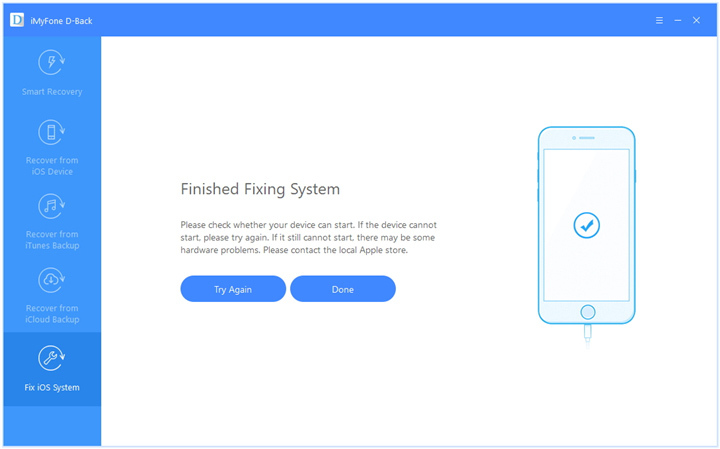 iMyFone D-Back comes with a “Fix iOS System” to fix almost all iPhone problems – including the iPhone stopped working problem. When it comes to the stuck iPhone, the “Standard Mode” of the Fix iOS System is the best way to go. 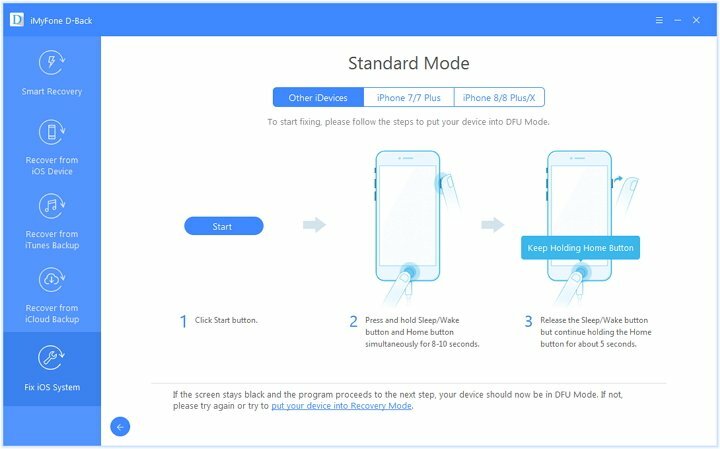 Following are the steps to fix stopped working iPhone with the standard mode of Fix iOS System function in iMyFone D-Back. Before starting, just download and install sit on your computer. Step 1.Connect your iPhone with the computer using a cable and wait for a few minutes. Then click the “Fix iOS System” tab and then select “Standard Mode”. Step 2.To start fixing, it is mandatory to put the iPhone in DFU or Recovery Mode. Step 3.Now D-Back will automatically detect your iPhone model and specify its firmware. 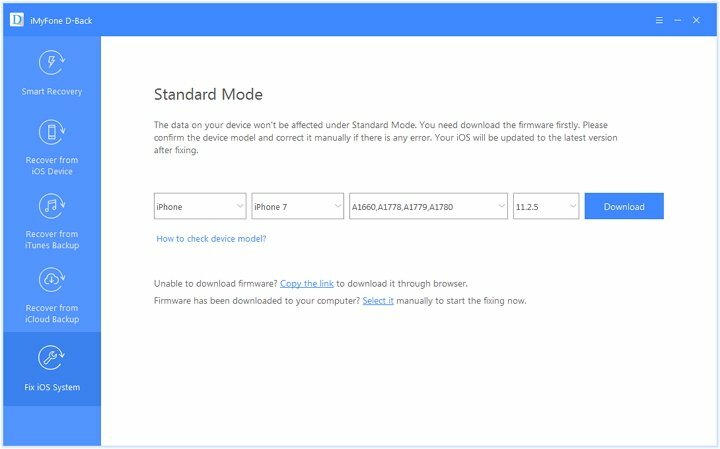 If iMyFone D-Back is unable to detect your iPhone model, you can manually select the iPhone model from the drop-down menu. Click “Download” to proceed. Step 4.After the downloading is complete, click “Start to Fix” to complete the process. After the screen shows “Finished Fixing System”, restart your device and the iPhone stopped working problem is most likely to be resolved. Step 1. Launch iTunes on your Mac or Desktop PC. Step 2. Attach the iPhone with the desktop using a cable and enter the password. Step 3. Select your iPhone device and click “Restore Backup”. Step 4. Determine the date, size, and type of the backup and select the most useful backup. Step 5. Click “Restore” and complete the process. Similarly, the drawback of iCloud restoration is that you will lose all data. First, you have to restore your iPhone as a new one. Step 1. Open “Settings” and go to “General”. Scroll down and tap “Reset”. Step 2. Tap “Reset all Content and Settings” and enter the encryption details to complete the process. Step 3. After this, the iPhone will be restarted. When the iPhone turn on after restoration, you will see a Hello screen. Complete the setup and click “Restore from iCloud Backup” at the App & Data page. Step 4. Now sign into your iCloud account with Apple ID. Choose the most useful backup from the list and restore the device. Note that the iCloud restoration can take a few minutes depending upon the backup file size. If you’ve lost the iPhone data after fixing iPhone stopped working issue, here is how you can recover the data using iMyFone D-Back. Step 1.Launch iMyFone D-Back on PC or Mac. Click the “Recover from iOS Device” and then click “Start”. Step 2.Connect your iPhone with the desktop and perform the trust. Then click “Next”. Step 3.Select the data types you want to recover. If you want to recover all the iPhone contents, mark ticks the “Select All” option on the top-right corner. Step 4.After scanning, D-Back will show a preview of recoverable files. Choose what you want and click “Recover” to complete. 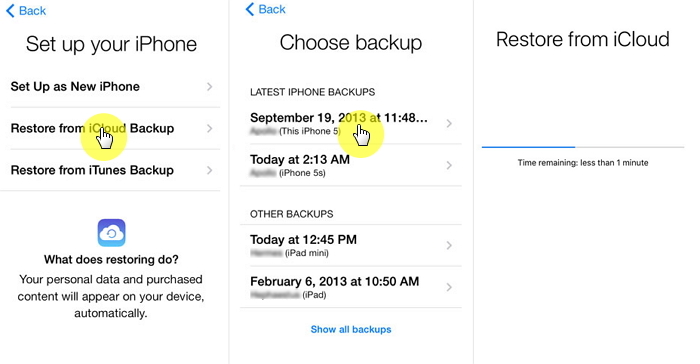 iPhone has provided its users two ways to make backups to keep the data safe and sound. There can be several reasons why the data can be lost. If deleted, it can be an uphill task to gather the data again. When it comes to iPhone users, they aren’t afraid of data loss. This is because iPhone users are blessed with iTunes and iCloud backup. 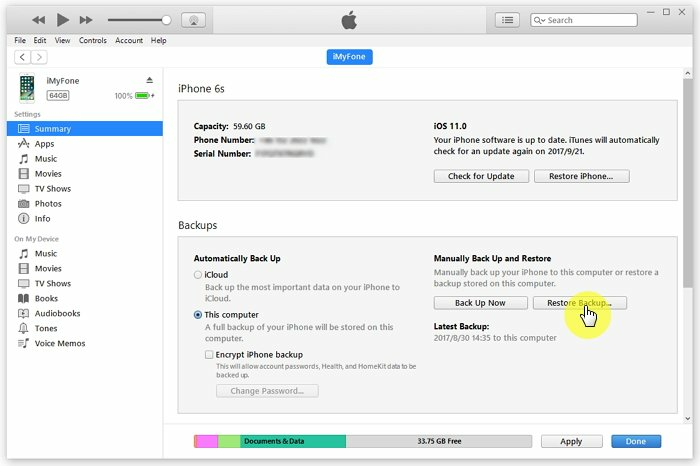 iTunes and iCloud do not allow you to select what you need to backup only. iTunes itself does not allow you to view the backup content. iCloud only offer 5GB free storage. 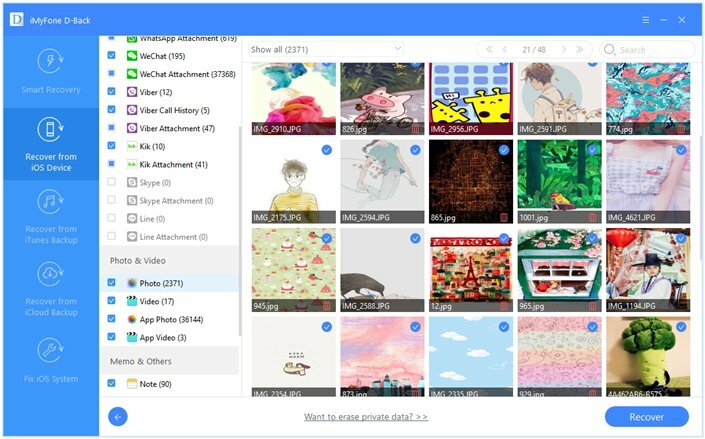 If you want to avoid all the above disadvantages of iTunes and iCloud, just try the free trial version of D-Back which allows you to selectively or fully backup and view what you want with no storage limitation. Moreover, you can view and download iCloud or iTunes backup with this all-in-one software. Do not hesitate to download it. The above solutions are most likely to resolve the stopped working iPhone problem. 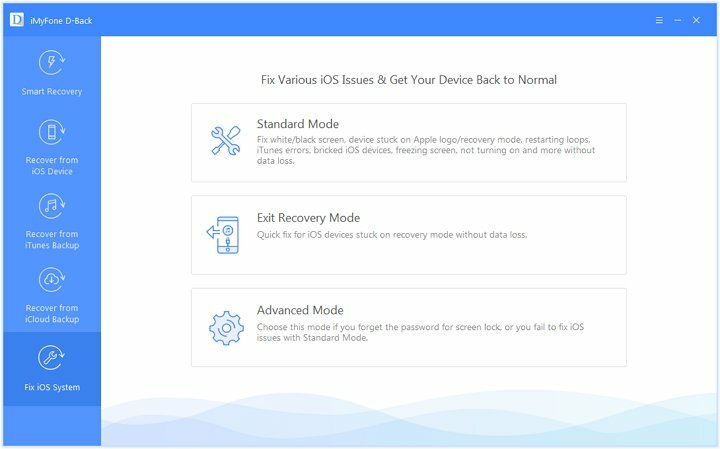 Overall, using the Fix iOS System utility by the iMyFone D-Back is the best and permanent solution to fix the stuck iPhone. Make sure to stick to the above guide before and while fixing. Leave a reply or any of your idea in the comments section and we’ll have a look into it.